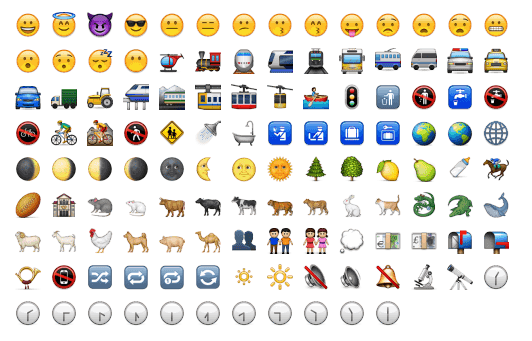 I’ve become oddly obsessed with Emoji recently and in examining the Unicode standardisation of Emoji characters I noticed a surprising number of common characters missing. When I say “missing” I mean missing from the canonical EmojiSources.txt file in the Unicode standard, but present in iOS. When I say “common” I mean no more obscure than any of the others and in every day use by iPhone owners. Splitting the omissions out and viewing them on Android, the glyphs are indeed missing from the system font.